The Ministry of Culture will establish the Cultural Content Institute next year to support the nation's creative industries and help introduce Taiwan's cultural output to the world. On Dec. 25, the Legislative Yuan passed the amendments to Articles 5, 7, and 30 of the Law for the Development of the Cultural and Creative Industries (文化創意產業發展法第五條、第七條、第三十條修正草案) as well as the draft Cultural Content Institute Establishment Act (文化內容策進院設置條例草案), both of which are aimed at rejuvenating Taiwan's cultural output. The Cultural Content Institute will focus on developing original cultural content and cultural applications of technology, setting up a financial mechanism for the cultural industries, expanding domestic and international distribution channels, and preparing Taiwan brands for international market entry. It marks another step toward facilitating the nation's cultural economy since the promulgation of the Law for the Development of the Cultural and Creative Industries (文化創意產業發展法) in 2010, explained Culture Minister Cheng Li-chiun. Minister Cheng pointed out that the institute will serve as a proxy between the government and private sectors to build a cross-sector and cross-field platform dedicated to facilitating resource integration, interdisciplinary collaboration, and investment. To ensure the completeness of Taiwan's cultural ecosystem, the Ministry began by launching the Cultural Content Investment Project (文化內容投資計畫) in April, investing a total of NT$100 billion granted by the National Development Fund to provide a better environment for the nation's cultural and creative industries. In addition, the Ministry has been adopting and developing professional investment evaluation tools — including a mechanism for evaluating intangible assets, a recommendation-based system for appraising the corporate social responsibility (CSR) of cultural institutions, and a credits structure for loans and financing — to establish a financial system for the cultural sector and encourage private investment. In the future, the Cultural Content Institute will also serve as a platform for business matchmaking and raise public and private investment for projects and businesses based on Taiwan's culture. 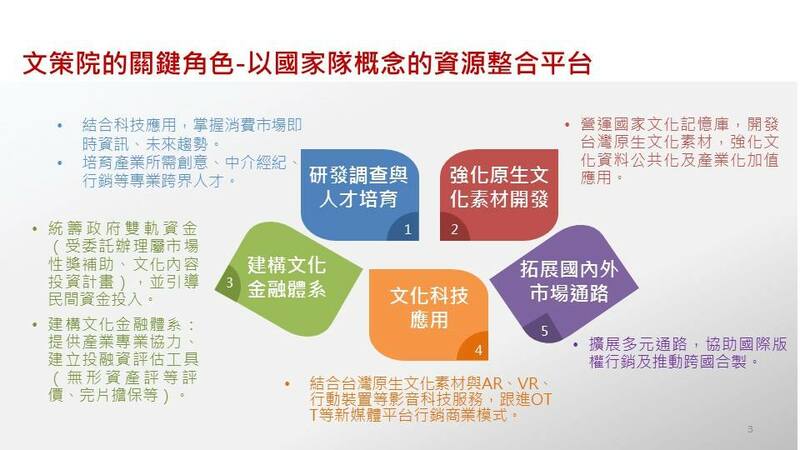 This June, the Ministry also established the Taiwan Digital Asset Library (臺灣數位模型庫), which offers an online database containing 3D models of heritage sites for applications in audiovisual works, animation, and video games, as well as for AR and VR creations. The National Memories Database Project (國家文化記憶庫計畫) and the Flagship Program for the Application of Cultural Content in Technology and Innovation (文化內容科技應用產業創新領航旗艦計畫), meanwhile, provide creators with opportunities for discovering and developing new materials and technologies. The institute will also establish a licensing platform for public and private cultural assets in the future. Moreover, the Ministry has been actively seeking international collaboration to introduce original stories of Taiwan to foreign markets. The institute will help strengthen Taiwan’s global image through culture and expand distribution channels by integrating resources from public and private sectors. The Ministry has formed a preparatory team for establishing the Cultural Content Institute in 2019. It will also hold public hearings to solicit advice to help guide further amendments to the Law for the Development of the Cultural and Creative Industries. Visitors Today:92. All Time Visitors:1,229,899.